The fifth instalment of our Fairy Tale inspired CAL - Happily Ever After is here! This week there are two small motif squares! 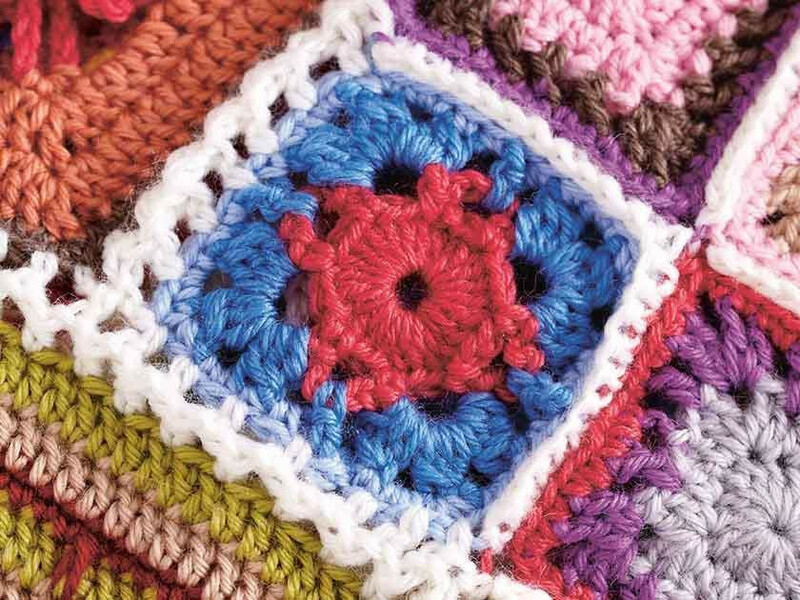 These lovely little squares are simple and quick to make! Made from a series of trebles, double crochet stitches and chains. If you missed out on the other instalments, don't worry you can still download them here. Please note: Follow the colour sequences as stated in the pattern. These images are for demonstration purposes. First round: With 3mm hook, make a slip stitch (sl st) in your chosen colour. Make 4 chains (4ch), to do this, take yarn over hook. Repeat another three times making 4ch in total. Work 15 treble (tr) stitches into the 4th chain from hook. To work a tr, take yarn over hook. Insert hook into 4th ch from hook. Pull through two stitches on hook. Pull through remaining two stitches on hook. Repeat a further 14 times, making 15tr in total. Join round with a slip stitch (sl st) in 3rd chain from hook. Second round: Work a 2ch. Work 1 half treble (htr) in next stitch (st). Take yarn over hook again and pull through st.
Yarn over hook and pull through all three loops on hook. Then work 2tr, 2ch and 2tr all in next st.
Work 1htr in each of the next three sts. Join with a sl st in 2nd of 2ch. Break off yarn. Third round: Join new colour, and work 4ch. Miss the next st and work 1tr in next st.
Work 1ch, miss the next st and work 2tr, 2ch and 2tr all in the 2 chain space (ch sp). Work 1ch, and miss next st, work 1tr in next st, three times. Work 2tr, 2ch and 2tr in the corner space. Join with a sl st in 3rd of 4ch. Fourth round: Join new colour, in same place as sl st.
Work 1ch, 1dc into each tr and ch sp. Work 1dc, 1ch and 1dc in each corner 2 ch sp. Sl st in first dc and fasten off. First round: With 3mm hook, make a slip stitch (sl st) in your chosen colour, in this case it's Raspberry (E). Pull loop tight and make 4ch. Work 23tr in 4th ch from hook. Second round: Make 6ch, miss the next 2tr from previous round and work 1dc in next st.
Fasten off (E) and join Aster (J) in any 5 ch sp. Work treble 2 together (tr2tog) in the 5 ch sp. To do this, take yarn over hook and insert into 5 ch sp. Without working any loops on hook, take yarn over hook again and insert into same ch sp. Take yarn over hook. Pull through all loops on hook. Then work tr3tog, to so this, work as before for tr2tog, adding in another yarn over, insert into ch sp, making it three times in total. Work the 3ch and then tr3tog, 3ch again in same space. Work 1dc in next 5 ch sp and then 3 ch. Work tr3tog, 3ch three times in next 5 ch sp. Repeat round referring to pattern. Join with sl st in top of tr2tog. Fasten off. Fourth round: Join next colour, Cloud Blue (G), in same place as st sl. Work 1ch, 1dc in tr2tog, 2dc in next 3 ch sp. Work 1dc, 1ch and 1dc all in next tr3tog. Join with a sl st in first dc. Omitting the final dc. Fasten off. And that's your fifth instalment complete! Make another 53 of the small motif one squares and 9 more of the small motif two squares, referring to the colour sequences in the pattern. Check out the blog next Friday for the sixth and final instalment!